I would like to know how to resize images in Ubuntu. What is the easiest tool to do so? 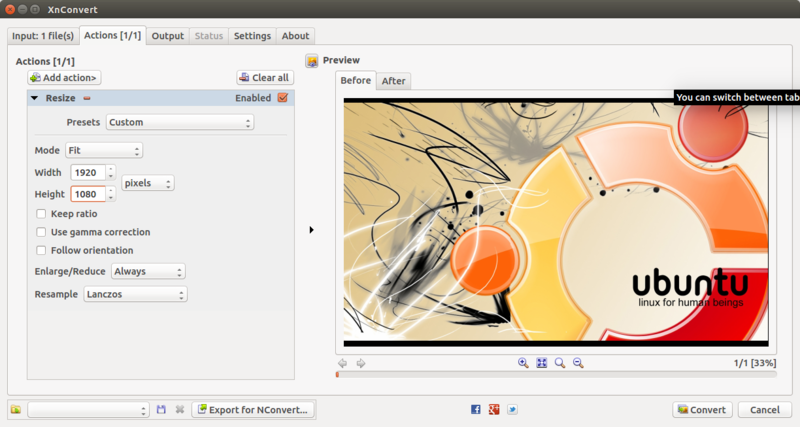 Run sudo apt-get install nautilus-image-converter, or click nautilus-image-converter . It adds two context menu items in nautlius so you can right click and choose "Resize Image". (The other is "Rotate Image"). You can do a whole directory of images in one go if you like and you don't even have to open up an application to do so. You need to restart your nautilus to see new context menus, run nautilus -q and then click the Home folder icon to reload nautilus with the new plug-in. You can also use: mogrify command-line tool from the same package. Note: You can add -auto-orient to automatically orient converted images. If you're just doing a couple of images, most image editors in Ubuntu (Gimp, F-Spot, etc) will let you do a basic resize. ImageMagick is good but it's a bit tedious if you don't know the setting names for things. You can very quickly learn Phatch by clicking around. ImageMagick is the package you want. It contains a number of useful command line tools for this very purpose. GIMP is probably the easiest way, since it has a fairly simple UI for such common tasks. All you have to do is open up your image and go to Image → Image Size and then change accordingly. There are ways to do batch resizing using the GIMP as well, but I don't know them by heart. At the moment nautilus-image-converter does not work in Ubuntu 13.10. Therefore I use imagemagick on the command line, which is very good workaround (at least for me). Mogrify does processing on the same image, it reads file modify file and writes the output to the same file. Convert is meant to work on separate images, reads file and modify and write to different file/format. You can also use convert command to use output file same as input file. Install gthumb. Simple and easy for basic image handling and editing functions - viewer, resizing, cropping, rotate, flip, grayscale, etc with options to save in JPEG, PNG, TIFF, TGA formats. For GUI, Phatch "one click is worth thousand photos" is the best for such quick job. It is already in Ubuntu repository. It has plenty of actions and options as imagemagick. There is a good multiplatform tool called XnConvert. Combine and choose between more than 80 different operations. The installation is simple through deb. file from the official website. It is free but not opensource, perhaps that's just the beauty of it. And if you want really fast JPEG image resizing - try epeg (as mentioned here and there) - which needs to be built from source. open the image in ImageMagick. click on the image command box will be open. view->resize enter the pixel you want. click on resize button. File-> save, enter the name. click on Format button choose the format you want and click select button. another option is select view -> original image and Drag the corners of the image to resize it. select File -> save. I use Pimagizer. It works great and it is the easiest application I have used. Tested on Ubuntu 14.04, 15.04, 15.10. See : https://launchpad.net/pimagizer/ for more infos. Not the answer you're looking for? Browse other questions tagged command-line resize image-processing or ask your own question. How to resize an image through the terminal? Can I resize multiple images in a directory to 160x160 at once? What is the best picture compression tool? How do I easily resize a wallpaper for my screen? How to resize images in 13.10 with context menu? What advanced image editor should I choose in Ubuntu for web developer work? Resize images to specific height value in ImageMagick? How can I resize 300 images at the same time? How to resize /usr and /root directories on Ubuntu via terminal?